108 Via Azurra Jupiter, Fl 33458 has been sold. WOW HUGE HOUSE, BEST VALUE AROUND FOR ITS SIZE! THIS FABULOUS ESTATE HOME ON PREMIUM LOT FEATURES 5 BEDROOMS, PLUS A DEN/OFFICE. DESIRABLE FLOOR PLAN WITH KITCHEN OPENING TO LARGE FAMILY ROOM. 1ST FLOOR BEDROOM & BATH, COOKS KITCHEN WITH GRANITE & STAINLESS, BEAUTIFUL WOOD FLOOR IN DEN, GREAT FORMAL DINING ROOM WITH BUTLERS PANTRY, FRENCH DOORS LEAD TO COVERED LANAI AND A BEAUTIFULLY LANDSCAPED FENCED YARD. SOME NEWER APPLIANCES, WATER HEATER AND A/C, UPSTAIRS/ DOWNSTAIRS LAUNDRY AND MORE! THE COMMUNITY HAS A TERRIFIC POOL, WONDERFUL PLAY AREAS FOR THE KIDS, TENNIS AND TOT LOTS. THE NEIGHBORHOOD IS CENTRALLY LOCATED CLOSE TO SHOPPING, DINING,GREAT SCHOOLS AND THE BEACH! MOTIVATED SELLER BRING OFFERS..
108 Via Azurra located in Jupiter, FL is a single family home with 5 bedrooms, 3 full baths and 1 half baths.The Home at 108 Via Azurra was built in 2005 in Paseos and offers a 2 car garage. This Paseos Home offers pool, tennis, bike - jog, clubhouse, picnic area, sidewalk, street lights. 108 Via Azurra Jupiter, Fl is currently listed for $634,900 under the MLS# RX-10414700. 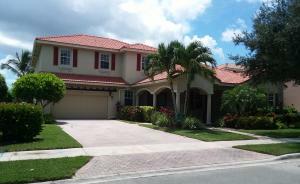 This Home has been put on the Jupiter MLS system and currently has a status of SLD.